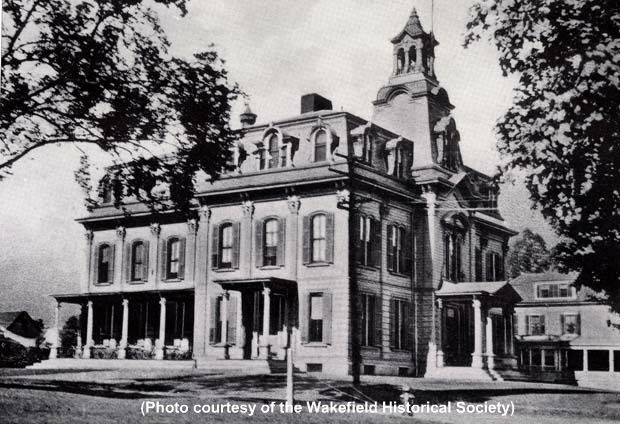 "Wakefield Town Meeting voted on April 3, 1871 to consider building a new high school to replace the South Reading Academy (site of the current Lincoln School) which had outgrown its usefulness. This task was assigned to a committee of five: Cyrus Wakefield, Lucius Beebe, Oliver Perkins, Richard Britton and George Packard. in May, Town meeting voted to purchase the old Prentiss property at the northwest corner of Lafayette and Common Streets. The property was once home to Rev. Caleb Prentiss, the seventh minister of the First Parish Congregational Church, who served from 1769 to 1803. The Prentiss house was moved to Traverse Street before the high school's groundbreaking in October 1871. The house fell victim to several fires over the years, and was eventually gutted by a fire. The high school was completed at a reported cost of $59,700 and was dedicated on October 10, 1872 in a ceremony presided over by J.S. Eaton, Esq. In his report to the Town in early 1873, School Committee Chairman Charles R. Bliss noted that the 'building, though larger than present needs require, will doubtless be none too large for our necessities in the future.' In 1900, the Town appropriated $15,000 to enlarge the school. The addition of 'six cheerful and commodious rooms to the old school building' was designed by Harland A. Perkins, an 1896 graduate of the school, and was completed at a cost of $12,000. The building remained as the high school until 1923 when a new school was built on Main Street. The building housed all eighth grade students, with the exception of the Greenwood students. It was renamed the Lafayette Builing and later referred to as the Junior High School. When the eighth graders returned to their neighborhood schools in 1936, control of the Lafayette building was transferred to the general use of the Town. The building was remodeled for municipal and veterans purposes in 1937 as part of a WPA project." -- Text from calendar by Jayne M. D'Onofrio. “Lafayette Building, Wakefield High School, 1907,” NOBLE Digital Heritage, accessed April 22, 2019, https://digitalheritage.noblenet.org/noble/items/show/7001.